Early literacy plays an important role in a child's future. However, the reality is that over 57 million children have no access to a school and another 100 million attend such inadequate schools that they will remain functionally non-literate. Curious Learning is an open platform that addresses the deployment and learning challenges faced by under-resourced communities, particularly their limited access to literacy instruction. We are developing a system of early literacy apps, games, toys, and robots that will triage how children are learning, diagnose literacy deficits, and deploy dosages of content to encourage app play using a mentoring algorithm that recommends an appropriate activity given a child's progress. 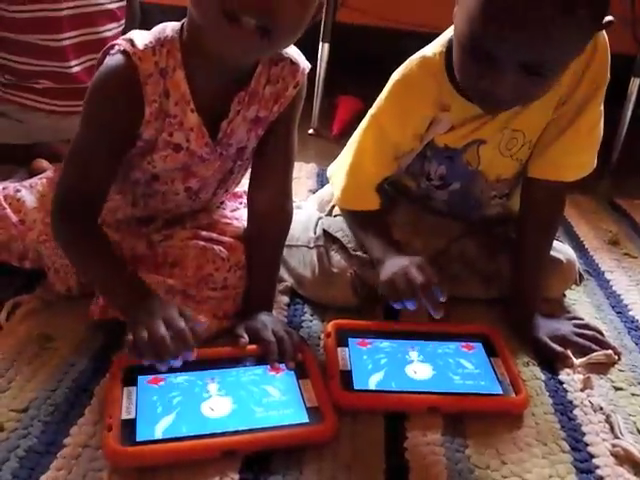 Currently, over 200 Android-based tablets have been sent to children around the world; these devices are instrumented to provide a very detailed picture of how kids are using these technologies. We are using this big data to discover usage and learning models that will inform future educational development. The open-source software enables any Android device to be transformed into a literacy mentor. This platform is presently deployed in Ethiopia, Uganda, India, South Africa, and rural United States. The open-source tablet software enables data collection across the deployment sites. By employing a data-driven approach to understanding learning behaviors across cultures and contexts, this project seeks to design and develop a personalized, adaptive learning platform. Breazeal, Cynthia, et al. "Mobile Devices for Early Literacy Intervention and Research with Global Reach." Proceedings of the Third (2016) ACM Conference on Learning@ Scale. ACM, 2016.